We are involved in a lot of small press comics and local comic groups, and are lucky enough to know a lot of talented writers and artists. So we are asking them to fill in for us, and come up with fun comics for a few weeks over Christmas. 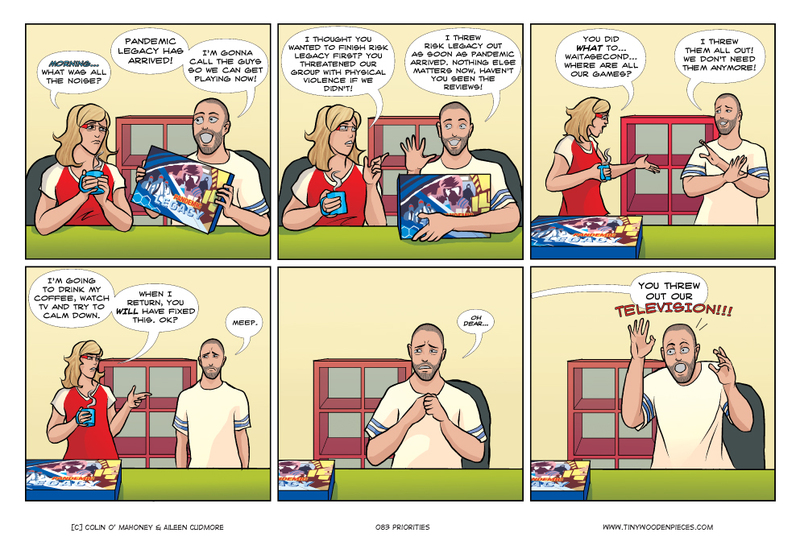 It will remain board game related, and we will be managing the whole thing ourselves, so it will be just what you expect -fun comics about our fun hobby. And I’ll still drop in with blog posts every week, to keep in touch with our great commentors, who I love hearing. … And suddently, A WILD IDEA APPEARS! This is a really big reason why I wanted to take some time off over Christmas. I realised I was writing far too many comics about buying games, the expense of the hobby, anticipation for games, and not that many about actually playing games. Because we never seem to manage to do that… So some time to just kick back and play games was needed. I think it will be good for the site. And we’re still uncertain about who to play Pandemic Legacy with. The maximum number of players would be great, but I can’t help but think the fewer the better, because that increases the chances of us getting through the campaign. I’m starting to think I may be the only gamer who has absolutely no interest in Pandemic Legacy. I don’t love Pandemic and there are too many other games out there I want to play to even consider playing the same one that many times with the same people, at the cost of playing other games. I like the legacy idea in theory as a novel way to play games but in practice it just doesn’t appeal to me. That’s fair enough, I can totally understand that if you’re cold on Pandemic then the idea of a whole campaign of it wouldn’t appeal in the least. For me, it’s Twilight Struggle I can’t get my head around. It’s been the no. 1 rated game on BGG ever since I got into the hobby, and I’ve played it a few times and I just … I really don’t like it. I feel like it’s all too predetermined and I’m just sort of moving pieces around in a semi-futile attempt to exert some control. It actually frustrates me to play it. Yeah, no interest there either. There’s a serious confirmation bias that has led to Twilight Struggle being number 1. People who are into it play it and love it and rate it highly. Most people have never played it so wouldn’t rate it poorly. So it’s self-selective positivity. BGG ratings should be taken with a grain of salt. I heard them talk about just that on the most recent Dice Tower, actually. I do tend to go with reviewers I trust more than anything else, although BGG is still an incredible resource to have to hand. Nope, you’re not alone. I have and like Pandemic. But the whole legacy craze mystifies me. I have no interest in that take on the games–replay-ability is high on my wants when I look at a game, and this concept seems to completely remove that–play one and done. BTW, I’m also cold on Twilight Struggle. Haven’t played it, but after reading up on it, it’s very far from my wheelhouse. We are definitely willing to sacrifice re-playability for an exceptionally good play experience -Sherlock Holmes Consulting Detective has shown us that. We are having an incredible time making our way through the ten cases, but once we have reached no. 10, there is nothing left in the game. Zero re-playability. But we have no regrets about getting the game. That last bit was hilarious 🙂 I have watched Dice Tower play-through of Pandemic Legacy, so i have no interest in it 🙂 Well, i didn’t have much before watching. I like Pandemic, but not buying much into Legacy thing. I guess games for me are more just games and i don’t want them to become novels or tv series. Watching it was fun, but mostly because of the great DT crew. Well, they think that it is one of the greatest games of 2015 now. So it appeals to some gamers. Thanks for the kind words about the comic. So, if you’re not into Pandemic Legacy, do you have a big ‘Christmas game’ that’s particularly exciting or enticing for you this year? What’s this? You somehow feel that you are real people who deserve a break over the Christmas period? Don’t you know you exist purely for our (mostly my) entertainment? I don’t think I could ever buy a Legacy-type game. Games are meant to be played, then replayed (sometimes after learning you were playing a rule wrong). Then replayed some more. To spend money on a game, going into it knowing that once you’ve finished the story that’s it? The game is now nothing but a large paperweight. Just… not my cup of tea. A few people seem to agree with you that the non-replayability of Legacy games is a big turn off, which isn’t something I would have thought to be that big a factor. Interesting, and very eye opening. We got Pandemic Legacy for USD50 and played it 16 times, which therefore costs $3.13 each play. That’s less than some of my coffee drinks, and certainly less than most other forms of entertainment. So while I generally “like to get my money’s worth,” we totally did. And the “idea” of throwing out everything else in the house? We practically did that until we finished the game. We seldom game on weeknights, but we made time for that during this campaign. It was fantastic. My wife and I decided to go 2p so that we didn’t have to wait for other people to show up. I am incredibly glad we did this. However, we are also planning to get another copy to play with friends and experience it as a 4p game. I understand that this isn’t for everyone. However, it was an incredible gaming experience for us. 2 Player might ultimately be the only sure option for us, too. Do you really think you could play it through again and get an enjoyable experience? I would have thought that knowing the twists and surprises would spoil it a little? I don’t think it will be the same experience by any means. As you said, we’ll already know the surprises. Maybe it’s because we’re both scientists that it still appeals to us to try it again tweaking the variable of number of players. Plus, as you know, each game of Pandemic is different, so how everything goes down could still feel different. I think the desire to play 4p is more about a strong curiosity than looking for the same excitement. Edit: Also, my wife just reminded me that we’re going to let our friends make most of the decisions, so we’re very curious to see how that changes the end results. Heh, I have ended up the same. Pandemic Legacy have arrived on my doorstep yesterday, and I can not wait to play it. However, this will mean, putting all other games of the table. (+I have made a mistake of buying a Dominion box, which I have instantly fallen in love with, witch makes it even harder. But I will try to push our group to finish more than one month in a sitting, which could speed up the process. Will see, wish me luck.